In the resumption of the Western Premier League on Saturday due to the Commonwealth Games, Stafforce Dumfries lost out to Clydesdale at Nunholm with insufficient Dumfries first innings runs enabling a win for the visitors. 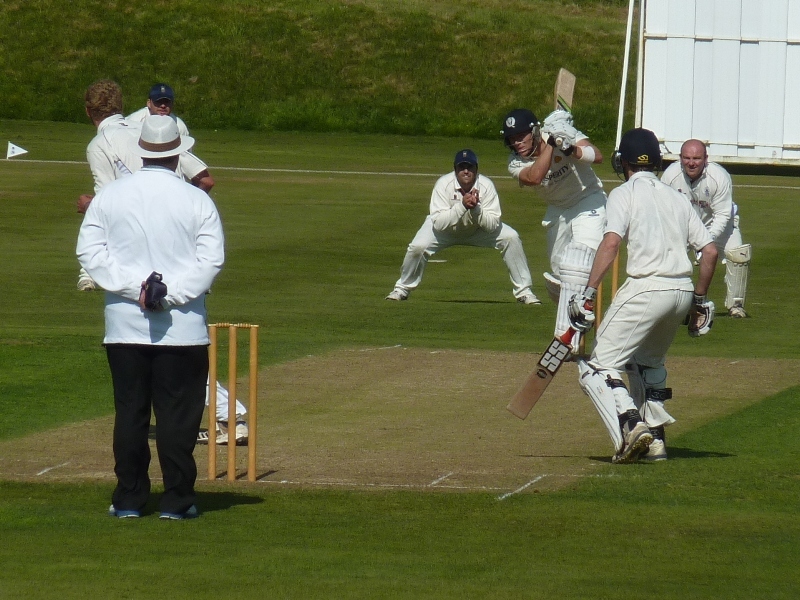 Scotland all-rounder Ritchie Berrington set the home side back when he took a wicket bowled in his first over and then was on a hat-trick in his third to have Dumfries at 15 for 3. Opener Alan Davidson and Chris Brockwell retrieved the situation but the latter became the first of six wickets for Scotland spinner Majid Haq when he was lbw. Then Davidson was out caught at long-off attempting to hit the spinner over the top for a score of 42 and Dumfries were back in difficulty at 61 for 5. Scott Beveridge and Stuart Corbett-Byers helped take the score up towards the hundred but Corbett-Byers mistimed a forcing shot off Haq and the later order found Haq a handful as he kept hitting the stumps. The last wicket added twenty as the Carson & Trotter Dumfries Man of the Match Beveridge forced the pace and hit a massive six onto the railway banking to finish with 48 not out but a final total of 145. Then Clydesdale professional South African Con de Lange ensured there would be no mistakes as the opener hit a rapid 47 including 2 sixes. 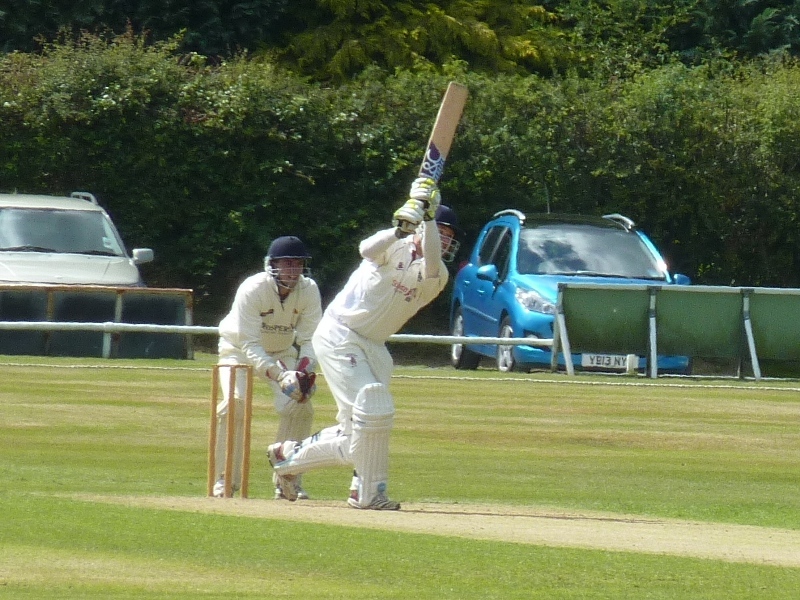 He was bowled by Niall Alexander but the opening partnership of 81 set up the win. Chris McCutcheon’s throw from the boundary ran out Haq by a distance but Berrington with 38 and opener Page with 37 saw the visitors home for the loss of no more wickets. In the Western Premier Reserve League Nunholm were unable to contend with a Titwood first innings total of 279 after they lost opening bowler Singh to a broken thumb in his second over. The System Hydraulics Nunholm Man of the Match Stuart Alexander took four wickets. Nunholm reached 126 all out in reply with Reed, Irwin and Johnstone all scoring in the twenties. Niall Alexander took two Scotland Probables’ wickets for the Scotland Possibles in the Scottish trial match in Edinburgh and Kirsty Strachan hit a match winning score of 21 not out for a T20 win for the Scotland Women’s Dev XI in Guernsey. The Murgitroyd Scottish T20 Finals Day on Sunday in Glasgow was postponed due to rain and takes place this Sunday when Dumfries face Clydesdale once more. On Saturday, Dumfries play Uddingston at home and Nunholm play at Bothwell. To contact the Club at Nunholm about junior, senior or women’s cricket call 07799 856094, email dumfriescricketclub@gmail.com or see www.dumfriescricketclub.co.uk .